Fats And Child Health – Know It! You often hear that you should avoid fats in children of all age groups. But the fact is, fat is one of the essential components in children's diets. 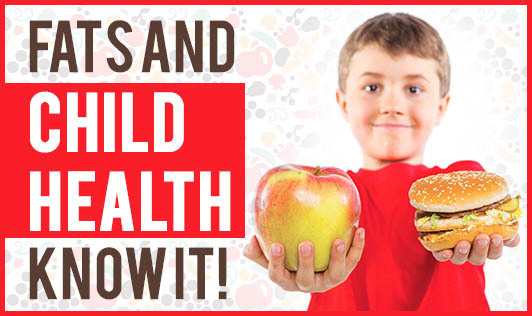 Young children should get 50% of their calories from fat! 1. Fats help in the formation of brain cell membrane and the myelin sheath around each nerve that greatly affect brain's development and performance. 2. It is essential to support their tremendous growth rate. 3. It aids in absorption of certain fat soluble vitamins like Vitamins A, D, E and K.
4. Helps in hormone development. 5. Keeps your child's appetite full for a long time. We know Poly and Mono unsaturated fats are ideal to use in day to day cooking as they have shown to prevent many diseases like cancer, heart ailments, diabetes, obesity etc. You also need to keep a watch on the intake of Saturated and Trans fat. And the bitter truth is that, trans fats are found in fast-food, fried foods, and most foods prepared in restaurants when compared to home cooking. Hence, total fat intake shouldn't be the only concern in a child's diet. Saturated and Trans fats are also found in hidden form in foods like animal products, cream, cheese, sauces, dressings etc. Aim to limit your child's calories from solid fats and added sugar, such as butter, cake, soda and pizza. 1. Infants: Breast-feeding is ideal nutrition and sufficient to support optimal growth and development after birth. Extend feeding up to 1 year to obtain right amount of fats. 2. Children aged 2 to 3: 30% to 40% of total calories should come from fats. 4. Encourage your child to eat and drink fat-free or low-fat dairy products, such as milk, yogurt, cheese or fortified soy beverages. 5. Consume less than 10% of calories from saturated fats. 6. Go for fortified oils when you purchase cooking oil, so that will help you meet the adequate requirement for certain nutrients. Fat is an important part of a healthy diet when kids eat the right kind in recommended amounts. Now, does your child get the right amount of fat?